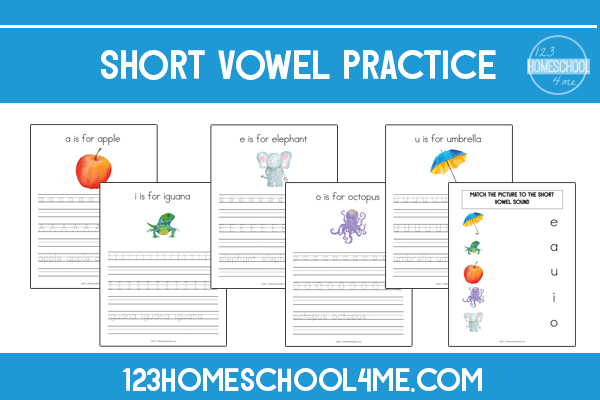 Teaching children to read begins with teaching short vowels. Once a child is able to distinguish beginning and ending sounds, the child is ready to begin learning short vowels which begin the first steps of reading. 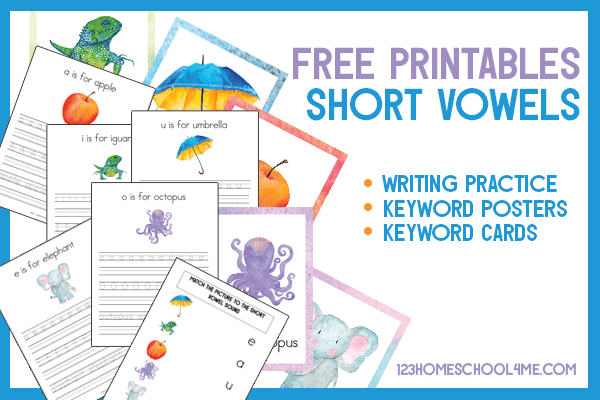 You’ll love these Short Vowel Printables to help! Short and consistent lessons are the most effective. Begin by focusing on one vowel then review that vowel and add in the next. Here is a simple plan beginning with the vowel “a”. Use the lesson with the free printables provided. Show your student the keyword image of the apple. Say the short “a” sound. Have your student repeat the short “a” sound several times. Go back and forth with your students saying words that contain the short “a” sound. Dictate simple CVC short “a” words to your child. 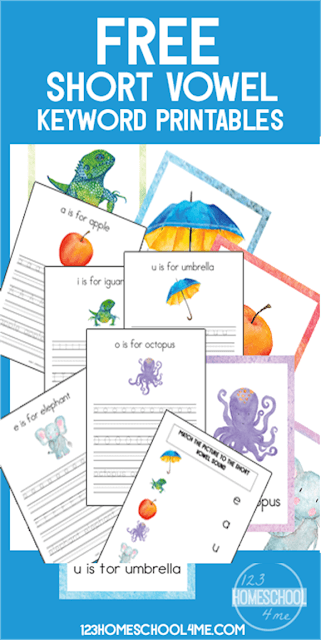 Have your child practice writing the letter “a”. As the child writes the letter have the child say the short “a” sound. Have your child draw pictures of words that have the short “a” sound. Show the child the keyword poster and have the child say the short “a” sound. Provide the child the keyword card to add to her notes and review anytime she needs to be reminded of the phoneme. Once your child masters the short “a” sound it is time to add the next vowel. During review and wrap-up, go over the previous sound(s) and the current one. Provide the keyword cards as you go to reinforce the phonemes. Keywords for each vowel sound aids the child’s memory for the phonemes. The keywords provide a visual prompt to help a child remember the sound and apply it to words. Keywords can be used for vowels, consonants, vowel teams, blends, and digraphs. During reading, if a child forgets a sound or has trouble, she can simply look to her keyword cards for the visual prompt. Keep all the cards in an index box or laminate and place on a book ring.